Blue Shadow Road is a painting by Laura Heggestad which was uploaded on January 15th, 2010. My delight in both autumn and bright, bold colors got another chance for expression here. 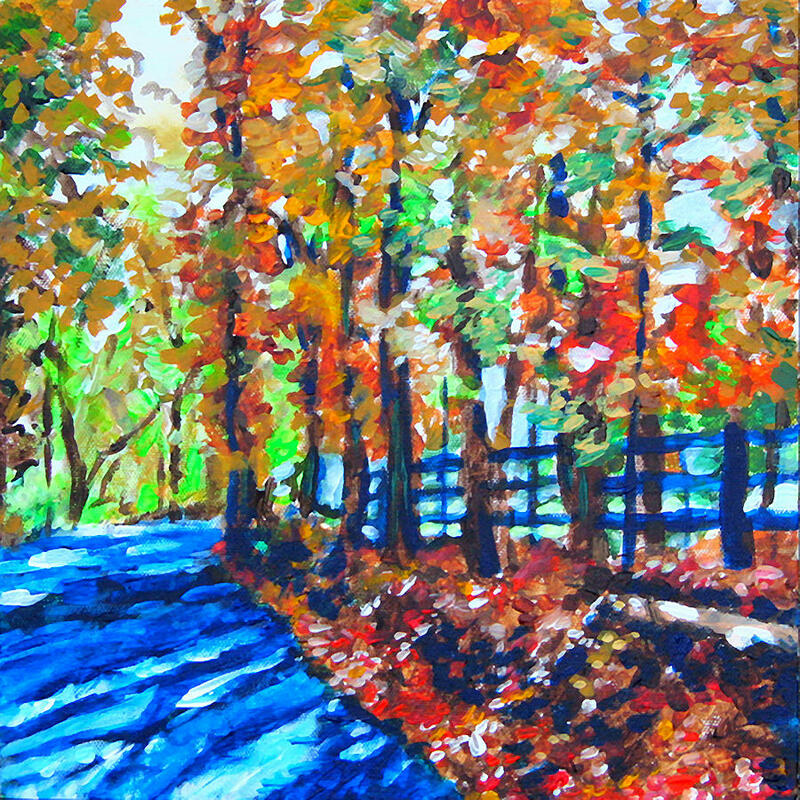 A friend commented on my choice of blue for the shadows in this piece, and that's when I started to realize that apparently not everybody sees blue in shadows on the road. It's true that I artfully exaggerate my own perception of this color, but for me it truly is there to begin with. Maybe that's why I so love scenic drives in the late afternoon...well, one of many reasons! I've used a light-to-moderate impasto in this painting. As noted in my profile, I would be glad to paint similar, original reproductions of this or any of my other artworks shown on this site! As a Former Landscape foreman, I know of a place in Arizona that looks very much like this. I cannot pick a favorite of yours, Thats impossible, but I LOVE this one. What a nice shady walk! Great work! You've captured Autumn so beautifully. Your paintings are a delight to look at. Your colors are dazzling. Great perception, Laura ! Mother Nature is an excellent beauty to treasure! Bravo!! Laura, your understanding and appreciation of the forest in autumn is so apparent in your work. You have a gift to be able to look beyond what is there and see the treasures that mother nature lays before us. I think that your use of blues in your artwork is what really makes your forest scenes feel so real. I have a forest nearby here in England and wander through it most weekends, and this is the first time that I have found somebody's interpretation of a forest in autumn, that truly represents how I feel inside. Many thanks to both Vivian and Ken! I only entered my artwork on this site yesterday, and I wasn't even certain how long it would be before anyone saw it. Thank you so much for your enthusiasm--I can't stop smiling! Very beautifl piece of artwork Laura. Love your very talented uses of color.